2.1. Connected Rings. 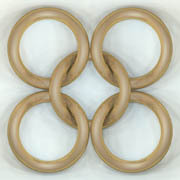 When we look closely at the structure in Figure 1 we see that this structure can be described in another way: it can be seen as a set of connected rings, as in Figure 8a. And in Figure 8b we can recognise the connected holes of the structure in Figure 2. So there seems to be a close relationship between both interpretations. A structure of interwoven layers can be translated into a structure of connected holes. We may ask whether this translation step can be used in both directions. That is, when we start with a structure of connected rings, can this structure be translated into a structure of interwoven layers? And what will happen when we start with a structure in which a more complicated ring, like the knot in Figure 8c, is used? 2.2. 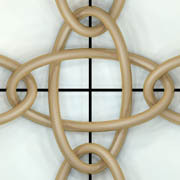 Connected Knots. Starting with a trefoil knot (Figure 9a) we first connect this knot to three other trefoil knots (Figure 9b). 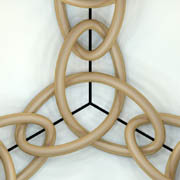 When we continue this, we can create a pattern of connected trefoil knots (Figure 9c). The question now is: can we translate this pattern of connected knots into an interwoven layer pattern? To examine this we can use the soap film method. In Figure 9d you can see a surface that connects parts of the lines of the trefoils like a soap film. We can continue adding more surfaces in this way (see Figure 9e and following). After the third step (Figure 9f) we do not get a direct connection between the first and the last part of the surface. Only when we go around twice (Figures 9g, h, i) do we get the situation that both ends meet. And now it looks like a double layer structure but it still is one single surface. 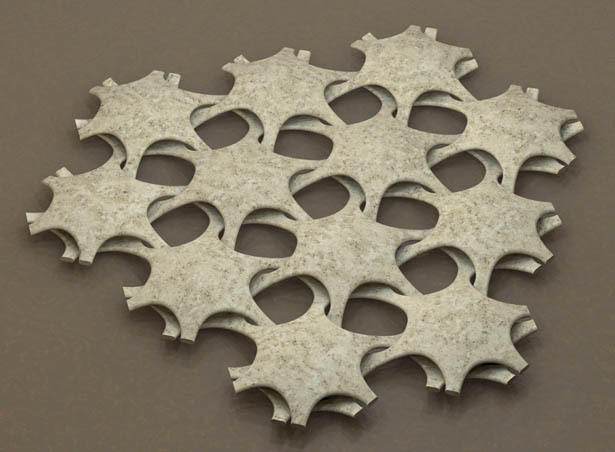 So in fact we have gotten an interwoven structure built with one single surface (Figure 10).